Dave and I found ourselves walking through the old city of Nevers, dragging our suitcases over cobbled stones, looking for the hotel we had booked ourselves into. The French can be so friendly and helpful and while we were being given assistance with the map, we saw a very inviting looking restaurant. We did not eat here on our first night as by the time we had found our hotel we were tired, and ready for something quick and easy to eat. 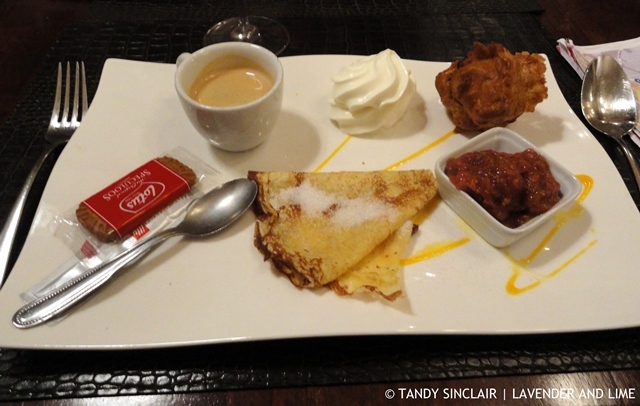 On our second evening in Nevers we decided to eat at St-Sébastien and I think we made an excellent choice. We were served a thicky and creamy and really delicious pumpkin soup as an amouse bouche. The owner told us that he fed his pig all the left over vegetables and last year they had an abundance of pumpkin to feed him. He was slaughtered for the table and only a year later did the owner walk down to his paddock to discover a field of pumpkins. This was definitely a good example of farm to fork. 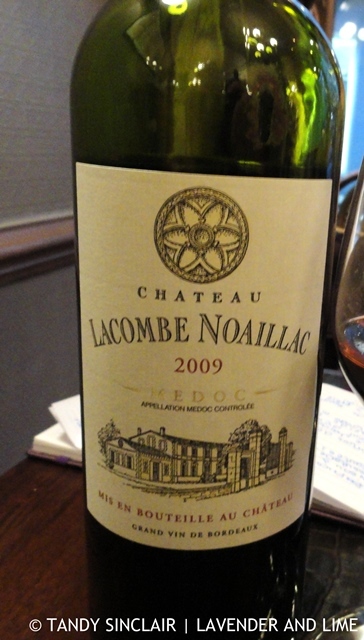 We chose a bottle of Château Lacombe Noaillac 2009 (€23) to enjoy with our meal. We sipped on the wine while reading the menu, which is all in French. The wine is light and from a vineyard established in 1834. It overlooks the estuary Gironde in the Bordeaux region. The nose and palate displayed red fruit, especially red currant and there were no tannins. The owner willingly helped us translate what we did not understand on the menu. Dave had the croustillant die peids de porc to start which was served cold, in a tasty pastry. The pigs trotters were served with a sauce gribiche. The portion was generous. I had the poivrons rouges pelée to start. The red peppers were chargrilled and served cold with a vinaigrette. Given that we were in beef country I chose the Tartare de bœuf Français as my main course. The beef was handcut and coarse in texture and had a hint of heat and was served with the most divine potatoes. 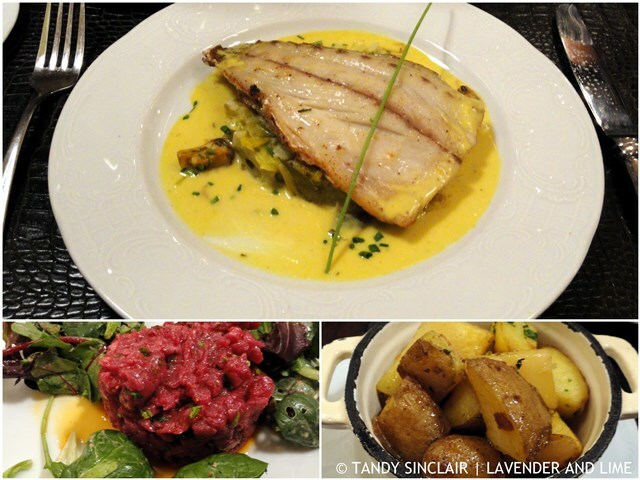 Dave had the Pave de maigre which is like a sea bass and was served with a fantastic Hollandaise sauce. Hidden under the fish were the most delicious leeks. Dessert for Dave was the Cafè gourmond salon l’humeur du chef and the selection of little taste treats with an espresso was the perfect way to end a meal. The desserts on the platter that night was a crepe, a choux bun, blackberry sorbet and a fig compote. The sorbet was by far the favourite. The menu is seasonal and changes daily, sometimes twice a day! Everything is fresh and one can see what drew the owners to purchasing the restaurant as the atmosphere is fantastic. The grand stair case makes a central feature and gives one the feeling of dining in a old establishment. Oh my, what a lovely lovely meal! So glad to see you are enjoying your time! 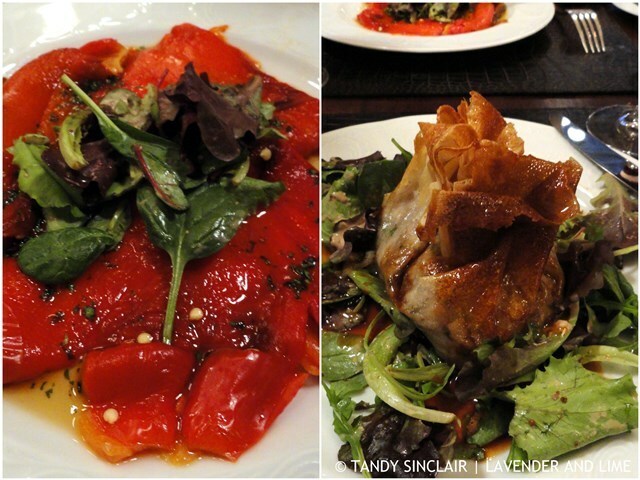 Looks wonderful – I try to oreder tartare in France whenever I can! What a magnificent meal. I cannot imagine changing the menu every day!